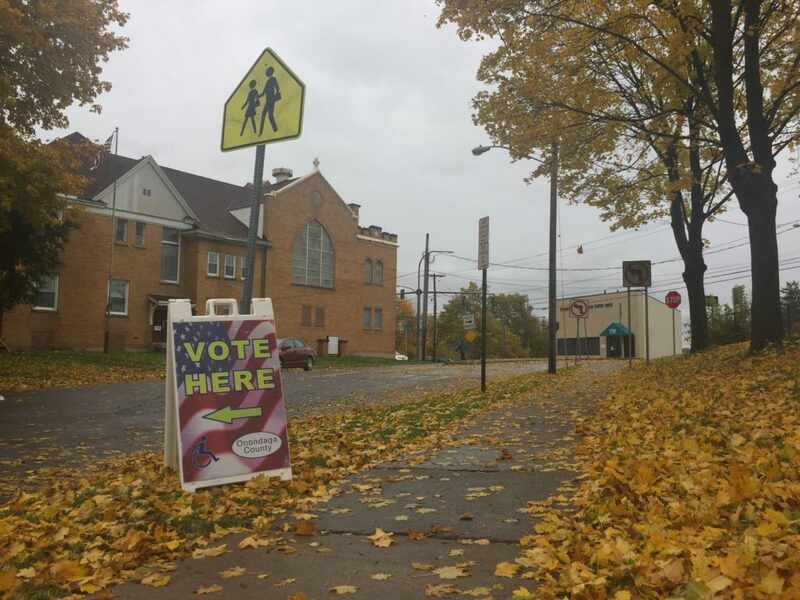 REPORTER: At Elmwood Elementary on the south side of Syracuse, voter turnout is up. Over 230 votes already cast by 10:30, including Gloria Barnett-Cheese, who had some special help casting her ballot. REPORTER: Gloria is accompanied by 8-year old twins Lou’nari and Lou’nai . The 63-year old grandmother says she’s teaching her grandchildren the importance of voting. GLORIA BARNETT-CHEESE: I tell them about voting. When I leave for good ,they can always say my grandmother told me that if you don’t want things to be then you can always come and vote and voice your opinion, other than that you can’t because there might be somebody you don’t like, but if you don’t vote you’re going to get the person you don’t like. REPORTER: Gloria says she’s voted in every election since she turned 18 over four decades ago, and Lou’nari and Lou’nai seem ready to follow her example. REPORTER: What do you think about voting? LOU’NARI AND LOU’NAI MIKE: It’s good … its good. REPORTERL For Democracy in Action, I’m Wyatt Barmore-Pooley. At Elmwood Elementary on the south side of Syracuse, voter turnout is up. Over 230 votes had already been cast by 10:30 a.m., which an election official said was up from previous years’ midterms. One of these voters was Gloria Barnett-Cheese of Syracuse, who had some special help casting her ballot. Barnett-Cheese was accompanied by her 8-year-old twin granddaughters Lou’nari and Lou’nai Mike. The 63-year-old grandmother said she’s teaching her grandchildren the importance of voting. “I tell them about voting. When I leave for good, they can always say my grandmother told me that if you don’t want things to be, then you can always come and vote and voice your opinion, other than that you can’t because there might be somebody you don’t like, but if you don’t vote you’re going to get the person you don’t like,” she said. Barnett-Cheese said she has voted in every election since she turned 18 over four decades ago, and Lou’nari and Lou’nai seem ready to follow her example. With matching silver raincoats and fresh “I Voted” stickers, the twins gave the same answer when asked about voting. “It’s good,” they both said.